Krone North America is introducing three new models of forage harvesters, putting Krone at the top of the big and powerful list. The models include the Big X 700, the Big X 850 and the Big X 1000 -- model numbers roughly corresponding to engine horsepower -- and each features Kron'e new VariStream crop flow design which uses a spring-loaded series of plates to alter the volume of the flow through the machine as volumes of harvested material change. A streamlined forage-flow design and engines from 775 horsepower to 1,078 hp. 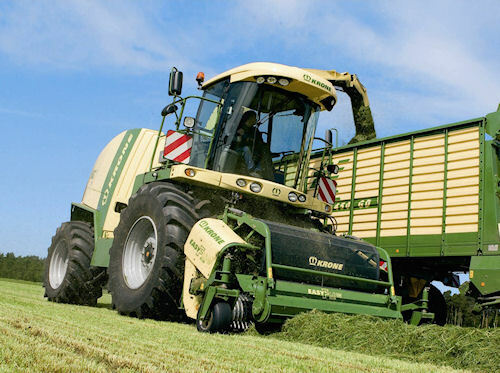 make the Krone Big X forage harvesters the biggest in their class. The Big X 1000 also has the operator option to run at an Eco-Power mode or X-Power mode, depending upon the load being encountered. In all three models, the new power plants allow harvesters with more power from a single engine that previous models equipped with two engines were able to accomplish. For more on the Big X line and Krone North America, visit www.krone-northamerica.com.